Not happy with my current faucet so I'm dwelling very seriously about a touchless facet. If I needed a new faucet, which I don't because I love my Blanco (similar to this one). I'd indeed look into the touchless type. However, like anything that gets such heavy use, I go for high-end fixtures. I'm not partial to those industrial styles that are really huge. I had one that wasn't quite touch-less, but did turn on and off by touch (an elbow would do). Used it for a few years. Kinda hated it; you were forever fighting with it, because the sensitivity varied and was inconsistent. We have a friend who is a plumber & he likes the Moen brand for finding replacement parts, one plumber's opinion. Moen also stands behind their products. I recently had an issue with their soap pump. Called their customer service and was promptly shipped all the replacement parts, gratis - no questions asked. (several years after the purchase). Decided on the Moen and am loving it after one day! Wino, Glad you are enjoying your new faucet. It's always a relief when you buy something new and you actually like it. What I do not like about kitchen faucets in general is that it is next to impossible to remove the diverter. We used to have great water pressure from the kitchen sink until I replaced the faucet. 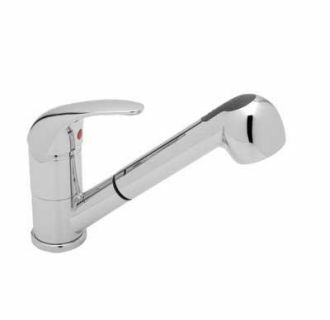 Ivy, it seems that today's faucets are made so that the diverter (or aerator) cannot be removed. I have the same issue with my shower heads....I like strong pressure but that seems to be a thing of the past. I easily removed the diverter from 2 of our shower heads. One is a Grohe and the other is a Waterpik bought at Costco. Below are a couple of photos of the diverter. Anyway, the diverter was in the handle and I removed with a tweezers.